"Tell the bank the check is in the mail." Joe Wong (Fong) is a private investigator, and he has a unique way of doing his job. He's behind on all his bills, his office is a pig sty, and all he really wants to do is go to his favorite eatery and have some chicken feet soup. He and his perky partner Diane (Stevenett) are barely staying afloat. One day John Templeton (Donahue), not to be confused with The Protector (1999), (who could surely handle this problem on his own), walks into Wong's office and hires him to find his daughter Karen (Bowling) who has gone missing. Despite Wong's warning that he "is expensive", much like Rod Armstrong, Donahue gives him the money and Wong is on his way. It turns out Karen has been brainwashed by the Universal Enlightenment cult and is spending most days farming at their compound called Unity Village. The leader of this mysterious cult is one Yarakunda (Mitchell) and his "sister-wife" Karma (Busia). Since this secretive organization doesn't take kindly to outsiders, meaning there are plenty of armed guards, Wong hits the local punchfighting (or in this case, pit fighting) circuit to hire some recruits to help him invade the cult and save Karen. Of all the ninjas, women, Chicanos and fat guys that all fight each other, he chooses Fuzzy (Farmer) and some others and then they all go to complete the mission. Using just their martial arts abilities and their wiles, will they succeed? Here the usual gang of troublemakers (Fong, Pierce, Mitchell and director Frank Harris, among others) reunite once more for another round of wacky, dumb fun. 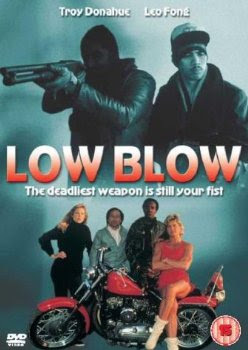 Despite the common low-budget pitfalls of bad film quality, choppy editing, and major issues with what must have been a script at one point, Low Blow remains "Low Brow" entertainment. Fong plays the goofy P.I. with some serious car troubles with nothing but flatly delivered catchphrases. The main issue of Low Blow is you can't hear anything. The sound quality is so amazingly bad, the entire movie is unhearable. It doesn't help that Fong never speaks above a whisper, and he has an accent. But what we could hear is funny. And when he's attacking the bad guys' car with a chainsaw, he always remembers his safety goggles. Cameron Mitchell, as the Jonestown-inspired guru, wearing a black hooded cloak and sunglasses, never stands up in the movie and appears drunk. It's a more laid-back Cam performance, especially in comparison to his bad guy role in Killpoint (1984). Also as counterpoint to Killpoint, Stack Pierce here is fairly underused as Corky. Yes, his name is Corky. But we can't forget an early appearance of Billy Blanks as a camp guard that fights Joe Wong. Unfortunately, the climax of the movie takes place at night and the filmmakers forgot to turn on any lights, so we can't see what transpires very well. The introduction of the punch/pit fighting adds a lot of color and flavor to the proceedings, and the addition of Fuzzy to the national consciousness was surely a good thing, though he lacks the joie de vivre of a Jack S. Daniels or a Bear. Also of note is the U.S. Vestron video VHS box art (seen at top of page). While a pretty cool piece of artwork in its own right, this person you see is not in the film. 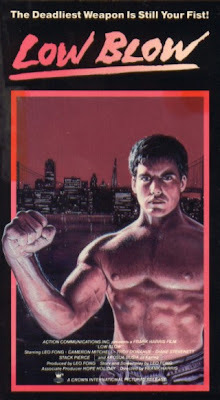 They invented him for the box art. What, was a picture of Leo Fong not good enough? That's shameful. But at least we can now see what it would look like if your fist was basically the size of your head. Yes, the movie is inept on almost every level, and the attempts at humor are...attempts at humor, but Low Blow proves ineptness isn't always a bad thing - it can be pretty entertaining if you are in the right mood. 'Blow isn't as bad as some say it is (although some technical aspects certainly are, but so what). If you need more Fong in your life, a good place to continue your obsession would be Low Blow. Surely you meant to put 5 stars on this review and not 2, Ty! Haha. Yarakunda! Yarakunda! Yarakunda! Haha you are totally right! our mistake! Love the bit when Fong smashes the guys face in with his foot! Funny movie though, Fong does indeed rock! All the cover art for this movie is hilarious! Leo Fong totally rocks! We have another Fong flick coming up this week! Nice. Looking forward to what you think of it! 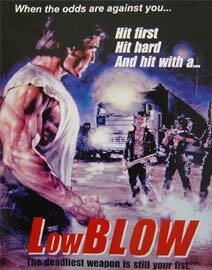 I always really liked that cover for Low Blow. I'm kind of jealous of his powerful fist! The lighting and sound problems sound similar to those which plagued L.A. Streetfighters. Your review has me extremely stoked to finally watch this one and it sounds like the YouTube clips don't do this film justice. Cinema De Meep: It is a cool fist, bigger than his head! and that guy on the cover is not even in the movie! Karl: So true about L.A. Streetfighters. A lot of sound and editing errors, but a fun movie nonetheless. About Low Blow: Definitely interested to read your take on it!